Sage One is one of the most exciting parts of our business – it’s designed specifically to help start-ups, small and micro businesses, freelancers and sole traders – and we’ve been hiring like mad! Over 50 people have joined our team here at our HQ in Newcastle upon Tyne in the last 12 months and so decided to have a bit of a chinwag with some of them. So if you’ve ever wondered who has been building the Sage One software that lets you manage your finances and pay your staff, or if you’ve wondered whether Sage One might be the right place for you, then read on! Hi David, how long have you been working in computer programming and what were you doing beforehand? I’ve been coding for a year – before that I had my own business as a tree surgeon! Coding was a hobby and my mate trained me up teaching me Python. Now I just want to progress as far as I can – coming to Sage has been brilliant for me and there’s so much scope for the future. 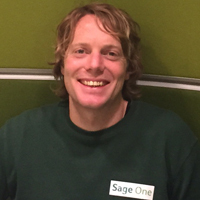 What made you choose a career at Sage One? I got into programming through Python before trying Ruby. I was working at a tech start-up in Campus North in Newcastle as an intern and wanted a full time role. I’d read about Sage and had a good friend who used to work here – he recommended it and now here I am! What do you like about working on Sage One? The team is the best bit – I’ve been welcomed straight away and everyone is incredibly helpful. They give you their time and help if you’re stuck. What training did you receive when you joined? It’s continual! At first – learn the processes here. We have two teams so it was getting up to speed on Agile and Kanban. We use Code School to help improve our Ruby skills and R-Spec and from then it’s continuous development. I’ve now joined the Kanban team and am fixing bugs so it’s great to be involved. What’s a typical day like in Sage One? I go through all the updates and then there’s the daily stand-up where we go through what we did yesterday and what we’ll do for the day. Then we crack on and get on with it! For me on the Kanban team I fix bugs in the code which is basically helping our customers. There’s also a fair amount of coffee thrown in throughout the day! If you’re passionate about what you do then Sage One is a great place to work. The whole team loves what they do and that attitude shines through. If you’re keen to learn then you can go really far. A pro surfer! I surf as much as possible and still live right next to the beach. Anyone who is passionate and keen to learn new things. Want to join the Sage One team? The good news is we have plans to hire even more people into our Sage One team! Keep an eye on our current openings here – www.sage.co.uk/careers, or connect with our recruiter Andrew McFetrich on LinkedIn. Feel free to ask Andrew or David a question on Twitter @AndyMacRecruits or @8igwave (what else) including the #AskSageOneTeam hashtag.